The North African countries of Tunisia and Algeria have seen widespread worker uprisings, riots and clashes between police and protesters for the past three weeks in reaction to rising cost of living, skyrocketing unemployment and poor living conditions. The mass protests in Algeria began in earnest earlier this month in reaction to soaring food prices and the high rate of unemployment. 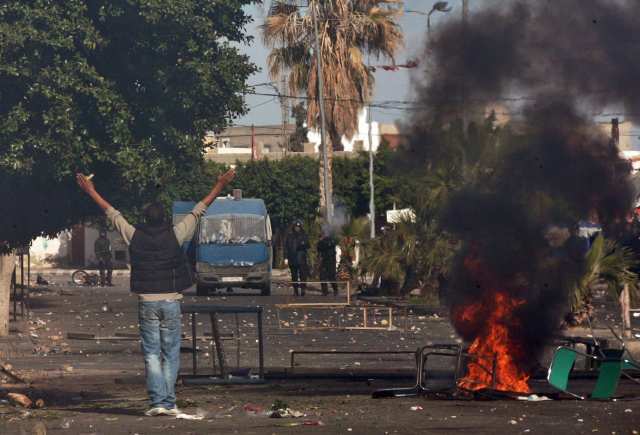 An Algerian minister claimed there were 789 wounded, most of the wounded being policemen struck by rebelling Algerians. Five people were killed. Protests ebbed after the government gave concessions to Algerian workers, promising to restrict the surge in food prices on basic staples like sugar, flour, cooking oil and milk. It also promised to cut import duties and taxes to curb the cost of food. Although order has mostly been restored, there are still embers of rebellion as far to the east as Constantine. 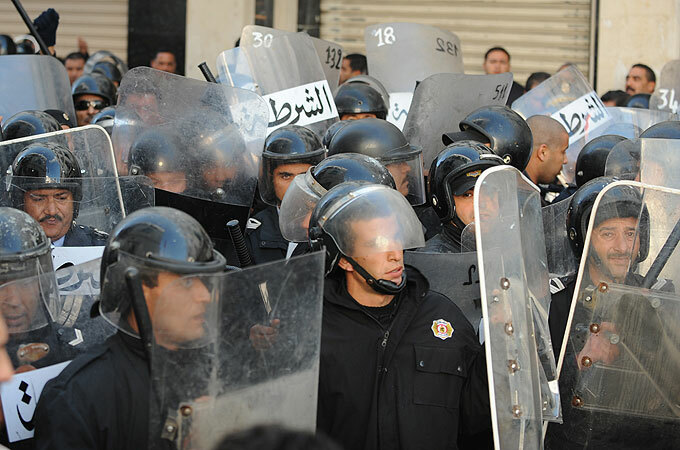 In Tunisia, the protests entered the capital city of Tunis for the first time. Zine el Abidine Ben Ali, President of the country for the past twenty-three years and a loyal ally of U.S. imperialism in the “War on Terrorism,” deployed the military in response to the protests. Around a thousand people were halted by security forces outside Tunis before reaching the main street. According to the reports, the police used excessive force, including tear gas on the rock-wielding crowds, causing cases of suffocation. The opposition claims that well over fifty have been killed by the police and military crackdown, while the government claims twenty-three. “Sadok Mahmoudi, a spokesperson from the regional branch of the Tunisian General Union of Labour (UGTT), said snipers had fired on the protesters in Kasserine. ‘The number killed has passed 50,’ he said, citing figures issued by medical staff in the town’s hospital for the past three days” (1). 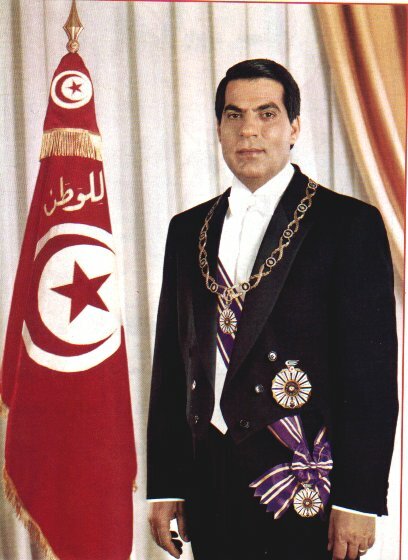 In an unsuccessful attempt to quell some of the protests, Ben Ali gave a speech on television promising to create 300,000 new jobs in the next two years and labeling protesters as “terrorists.” The uprisings continued throughout the country during the day and throughout the night on Wednesday even after the Tunisian military were called in. Schools and universities have been closed down by decree, and the internet has been heavily restricted. By the 11th, shops and cafés were closed forcefully. A curfew from 8pm to 6am local time has been enacted, but it hasn’t stopped the protests for a moment. Tens of thousands took to the streets the next day. Protests are exceedingly rare in Tunisia. This is the first significant rebellion since Ben Ali took power in 1987. “Since [the end of 1990] the circle of repression has continued to expand [from the Islamist party] and has included political opponents and government critics, both men and women, across the political spectrum, especially supporters and sympathizers of the PCOT” (2). 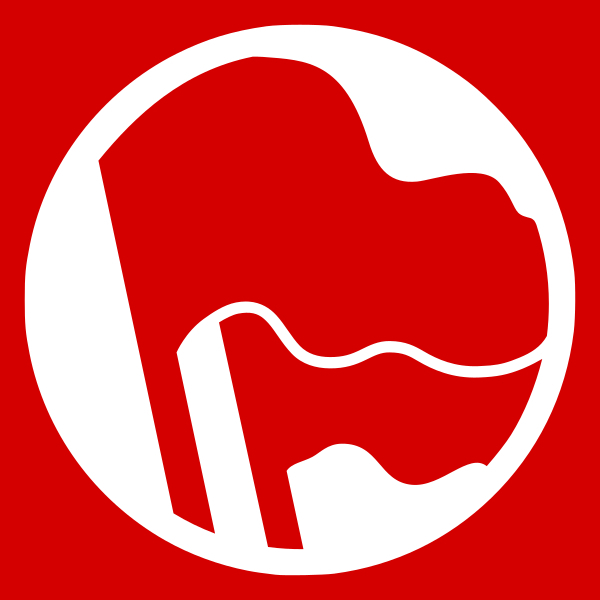 The Marxist-Leninist party in Tunisia is the Communist Workers Party of Tunisia (PCOT), a party outlawed by the government. We stand in support for the revolutionary forces in Tunisia and stand in solidarity with the Tunisian working class. The PCOT issued a statement by comrade Hamma Al-Hammami. 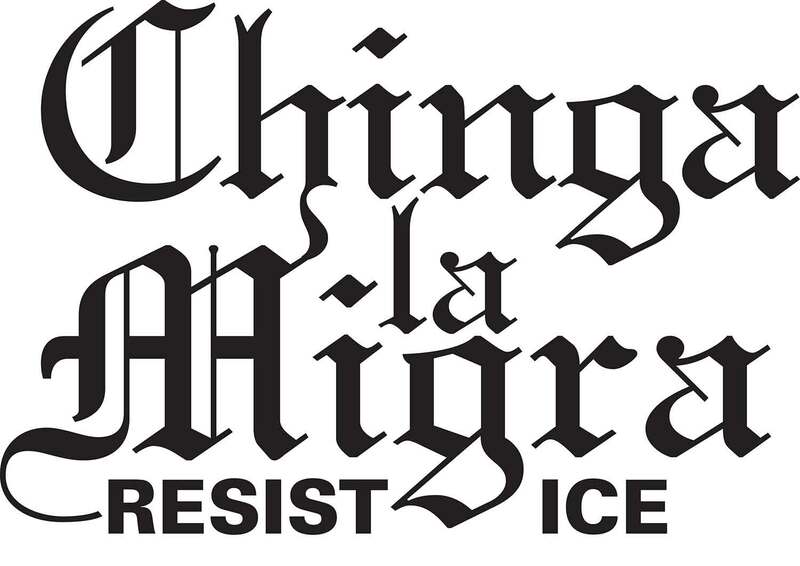 It called for revolutionary change, a stop to police shootings, support of the protests and for the release of political prisoners and dissidents. The protests also contain workers, students, lawyers and members of the banned Renaissance Party or Parti de la Renaissance, an Islamist opposition party. 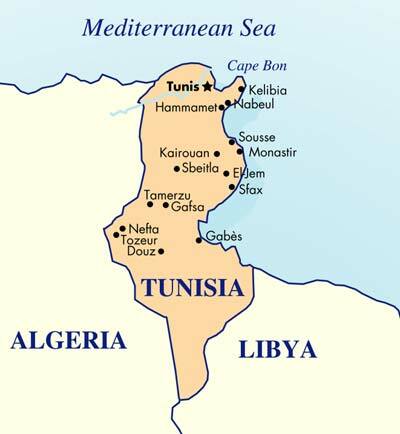 “Tunisia has a population of about 9 and a half million people. France has about 6 times that number. However, both those countries have the same number of police forces, around 130,000. 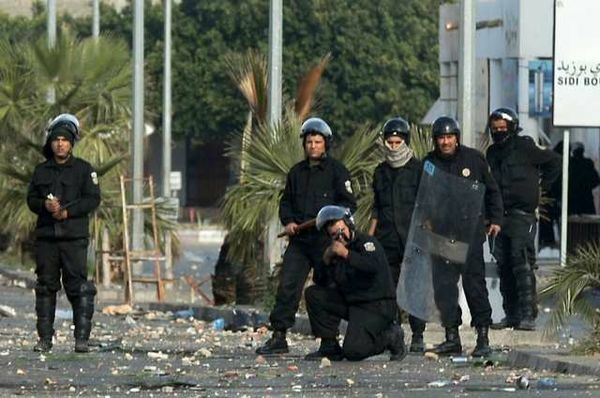 One can thus see how repressive the Tunisian regime really is. Opposition parties are not allowed, and those that are now and then permitted to function legally are totally submissive to the Tunisian regime. Parties like the Tunisian Workers’ Communist Party (PCOT) and the Islamic Party were banned from the political arena” (3). There are reports of detained protesters being tortured. “’We’re talking about 150,000 policemen who are used to torturing and abusing people’” (4). Demonstrators have also broken into warehouses to steal bags of flour and other basic foodstuffs. Stores of the necessities of life, such as supermarkets, pharmacies have been emptied. Mansions of wealthy members of the President’s family have been ransacked. The pictures of Ben Ali which normally line the streets and windows of buildings and shops have been torn down en masse and are being burned. There have been mass arrests of opposition figures and leaders, such as El Général, the popular Tunisian rapper and performer of popular dissident songs. Although he is now free, the same cannot be said for the leading activists and comrades of the banned Tunisian Workers Communist Party (PCOT), Ammar Amroussia and Hamma Al-Hammami, who have endured torture and arrest before. These leading revolutionary activists were seized for advocating a change of government. Prime Minister Mohamed Ghannouchi announced that the Ben Ali government would make concessions to the people, including the dismissal of Interior Minister Rafik Belhaj Kacem (accused of use of excessive force in dealing with the rebellions), his replacement with Ahmad Freaa, and the appointment of committees to investigate corruption. This comes just days after “Samir Laabidi, minister of communications […] accused ‘Islamic and left-wing extremists’ of manipulating the protest movement and said police had been forced to shoot the protesters because they had crossed the ‘red line’” (5). Mohamed Bouazizi, the young man whose self-immolation set off the uprisings. The Tunisian protests erupted on December 17th when a young unemployed worker committed suicide by lighting himself aflame in protest of chronic unemployment and police brutality: “Analysts say the unrest, which started when Mohamed Bouazizi, a young university graduate, immolated himself in the town of Sidi Bouzid after police confiscated the fruits and vegetables he was selling without a permit, is the result of domestic frustration, especially among young people, over years of high unemployment and political stagnation in the former French colony. It is unlikely, they say, that it is being driven by the hidden hands of foreign forces as the government has suggested” (6). 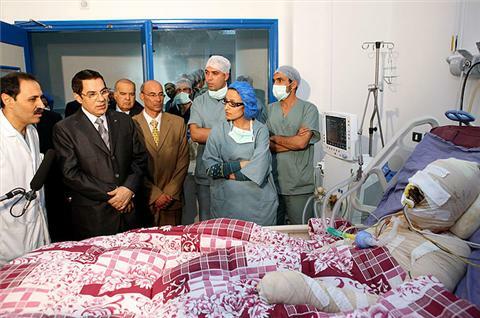 The young Bouazizi would later die from third-degree burns. He had bought the gasoline he used to burn himself alive with the last of his money. He committed this act of desperate defiance in front of the Sidi Bouzid City Hall. Tunisia has closed its embassy with Qatar, accusing the news service Al-Jezeera of conducting a propaganda campaign to destabilize the country, claiming they are exaggerating the size and extent of the protests and that the protests themselves are the work of foreign agents. 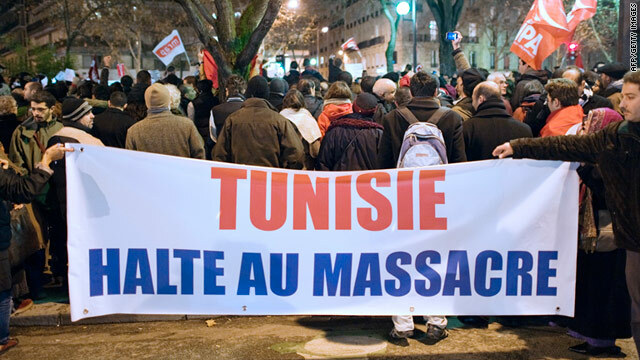 In contrast to the “protests” in the Islamic Republic of Iran last year, the imperialist powers have taken a universal approach of support towards the Ben Ali administration, as the protests in Tunisia were triggered by the death of Mohamed Bouazizi and the corrupt nature of Ben Ali’s government. Secretary of State Clinton has said the United States “hope[s] that there can be a peaceful resolution. And I hope that the Tunisian government can bring that about” (7). “Those arrested include a party member [Hamma Al-Hammami] who was a spokesman for protesters in the town of Sidi Bouzid, a leader of the banned Tunisian Workers Communist Party and a journalist” (8). As well, “Ammar Amroussia, the correspondent of the banned daily Al-Badil and its website (www.albadil.org), is still in jail in Gafsa (400 km south of Tunis). Arrested on 29 December, he is facing up to 20 years in prison on charges under articles 42, 44 and 49 of the press code, articles 121, 131, 132, 220b, 315 and 316 of the criminal code and article 26 of a 1969 law on public meetings, processions, exhibitions, demonstrations and gatherings. He covered the recent events at Sidi Bouzid for Al-Badil and took part in many demonstrations in Gafsa, accusing the authorities of corruption and urging his compatriots to combat the ‘dictatorship'” (9). 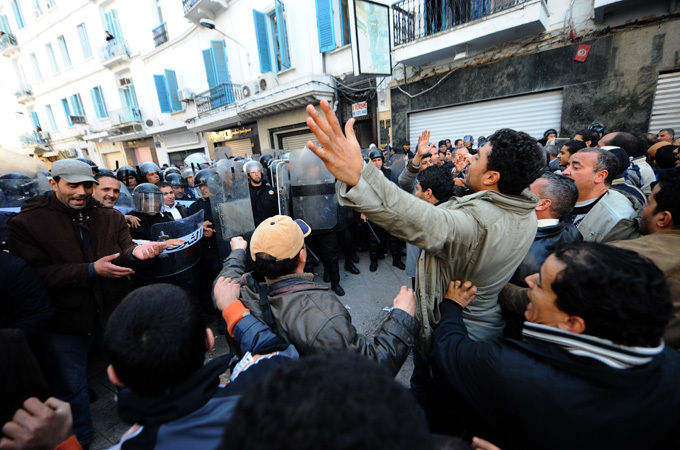 Despite these repressions, the government of Tunisia is showing weakness, and the protests continue unabated. We call for support of the revolutionary forces in Tunisia. Solidarity with the masses of Tunisia and Algeria! 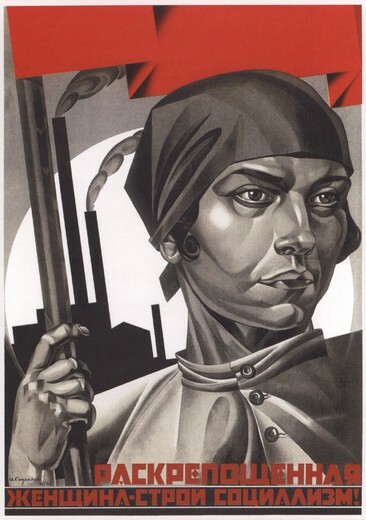 Solidarity to political prisoners and the PCOT!